Chilling morning for the young aspiring table tennis players at Memorial Gym. Over 70 players from all across the bay of plenty attended this new event, which was a demand in secondary school events. Junior grades was an close endeavor with Bethlehem Jason Liu taking out the singles title and in the doubles Tauranga Boys College Charlie Paterson and Gerhard Van Der Merwe taking out the doubles title. 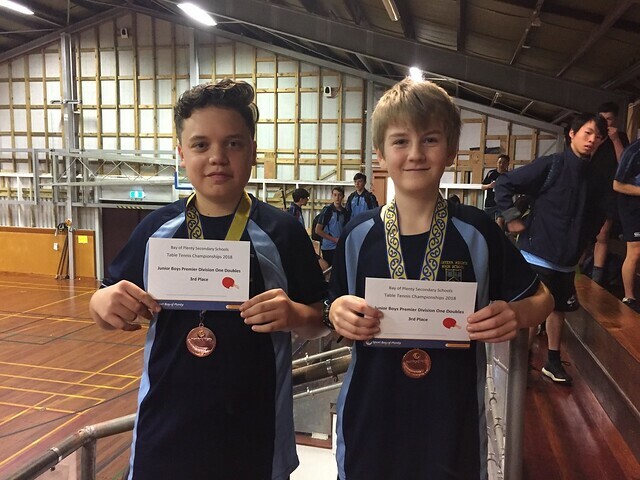 The senior event was explosive and exciting to watch the display of table tennis between Max Henderson from Tauranga Boys College and Xavier Lea from Papamoa College. The two boys battled out the singles senior boys title, the skill factor of these two boys was exciting and the skill of these two talented boys. The power forehand of Max Henderson and serving power beat Xavier Lea superb power back hand. Senior boys Doubles was won by Tauranga Boys College Max Henderson and Anthony Quellet. Thank you for the support of Tauranga Table Tennis Club and Lesley Paul and John Lea for running the tournament without you guys this event would not be possible.